Zachary Israel "Zach" Braff (born April 6, 1975) is an American actor, director, comedian, screenwriter, and producer best known for his role as J.D. on the television series Scrubs. Braff was born in South Orange, New Jersey. He wanted to be a filmmaker since early childhood, and attended Stagedoor Manor, a performing arts "training center" for youth actors. He later attended the Northwestern University School of Communication, from which he graduated in 1997. 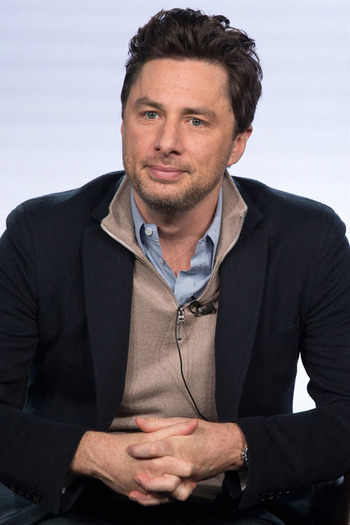 While Braff has had minor roles in a handful of projects including an episode of The Baby-Sitters Club and Manhattan Murder Mystery, his Star-Making Role was as John "J.D." Dorian in Scrubs, for which he has been nominated for three Golden Globes and an Emmy. In addition, he has directed several episodes and served as the executive producer for the ninth season. Outside of Scrubs, Braff has worked behind the scenes in several movies and performed in public theater numerous times. Star-Making Role: Playing J.D. in Scrubs launched Braff into the public eye. Star-Derailing Role: The Last Kiss. He was given complete creative control over the project in the hopes of reproducing the success of Garden State, but it fared so badly with both critics and audiences that he pretty much dropped out of the limelight until his bit part in Oz: The Great and Powerful. He dug himself deeper with Wish I Was Here, which required a Kickstarter campaign to get the funding, souring his reputation further and opening to mixed reviews in a limited release.